On December 22, at the Gazprom Arena in St. Petersburg, SKA and CSKA will play the 2018 Hockey Classic. As more than 60,000 tickets were sold, it’s already clear that the KHL will see a new attendance record. KHL.ru tells you about the best outdoor games in Russian history. Moscow, Red Square. January 10, 2009. The first-ever KHL All-Star Game had to be not only an exciting meeting of the best players in the league but also a great way to showcase the newly-established competition. Today, almost ten years later, that game is a source of great memories. In the world-famous Red Square, with the beautiful background created by the Kremlin walls, the team captained by Jaromir Jagr and Alexei Yashin gifted the crowd a fantastic hockey show. The game played at minus 20°C is remembered for the fierce battles and competition. At times, it looked like the three-thousand crowd was assisting not to an All-Star Game, but a Gagarin Cup clash. After losing the first period with a 1-3 score, the Russian players first caught up, then went ahead with less than five minutes to the horn. However, two late goals turned the wheel in Team Jagr’s favor. Helsinki, Kaisaniemi Park, December 2, 2017. 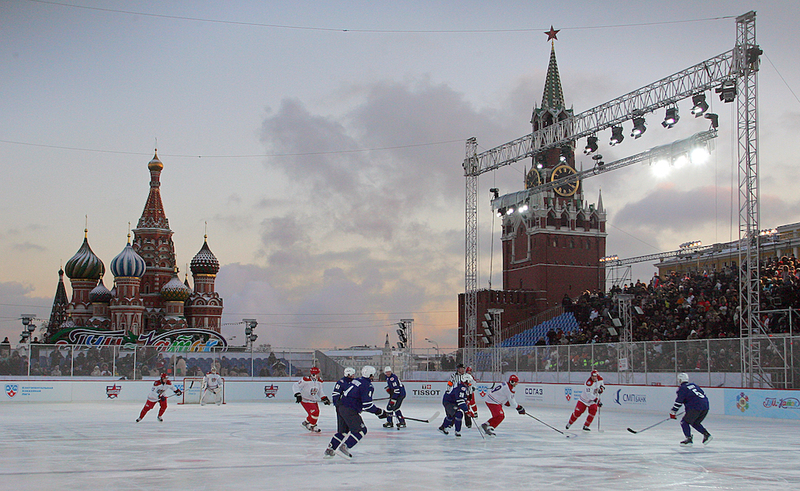 KHL fans had to wait almost nine years for the first competitive outdoor games. At the Kaisaniemi Park in Helsinki, Jokerit met SKA. 2017 was an eventful year for the KHL and Finnish side: The League celebrated its tenth birthday, the fiftieth anniversary of Jokerit’s establishment, and 100 years of Finnish independence. This time, the weather was favorable: plus-three, no snow – not surprisingly a full house gathered at the stadium. 17,645 spectators is to date a record attendance for KHL games. However, the clash between SKA and CSKA in St. Petersburg will break the record by almost four times! The match ended up being exciting and rich in goals scored. The best player of the night was Ilya Kovalchuk, who scored 3 (1+2) points and led SKA to victory. However, at the end of the third period, with SKA being up 4-2, the hosts managed to cut down their gap to a single goal but lost the game in spite of their efforts. Riga, Purvciems. January 18, 2019. The first outdoor KHL regular-season game was so successful that in Riga, Dinamo tried hard to set up an even more successful event. However, the Latvian club decided to give to their event a more comfortable feeling: the match took place in one of the sleeping districts of Riga, the Purvciems borough, in the courtyard of a regular school. 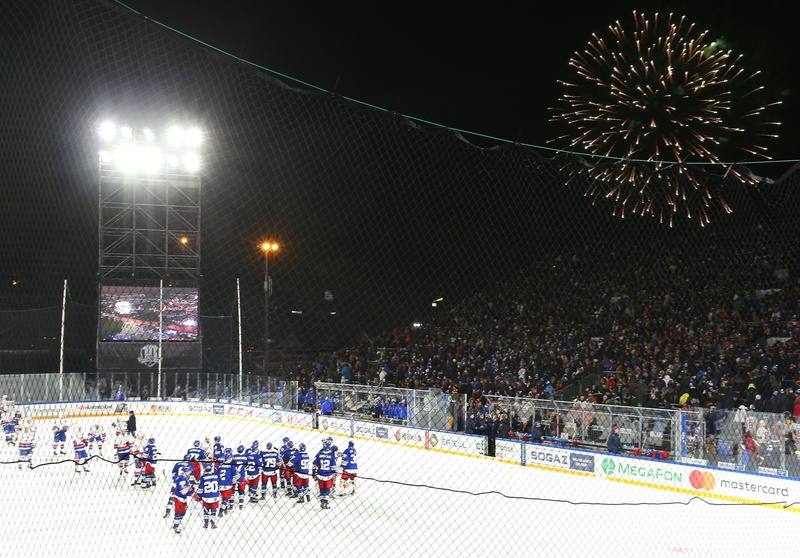 The game in Riga was the first KHL outdoor game to be played under natural illumination as the two Dinamo clubs faced at 1:00 PM. Around the area for mass skating, temporary stands were erected, which turned out to be sold-out. The match was attended by 10,500 spectators who witnessed a dramatic game. The hosts gained a 2-0 lead, but at the very end, they lost 2-3. Krasnoyarsk, Central Stadium. February 17, 2012. The very first hockey game played at an outdoor stadium in Russia’s recent history was the VHL clash between Sokol Krasnoyarsk and Lokomotiv Yaroslavl. The players hit the ice in a cold February evening, with temperatures reaching minus-20. The location of the stadium added a further layer of extremeness to the event, as the Central Stadium in Krasnoyarsk is located on a peninsula, getting all the rash winds from the Yenisei river. However, the severe weather conditions didn’t scare the Krasnoyarsk public, who flooded the gates and reached an attendance of more than 16,000. Oddly enough, once again the hosts lost the game, not without giving Lokomotiv a real battle, rallying back after being down 0-3. Pyotr Vorobyov – the father of Ilya, today’s SKA and Team Russia head coach – was on the bench for Lokomotiv. Moscow, Luzhniki Stadium. March 5, 1957. It’s interesting to note that the record recently beaten in St. Petersburg – when more than 70,000 fans witnessed the Team Russia win over Team Finland – the record for the most attended hockey game in Russia belonged to a game played as far back as 1957. Moscow hosted the 1957 World Championship, where just one year before the Luzhniki complex was built. The tournament organization didn’t rush to have games played under the roof of the just-erected Sports Palace. 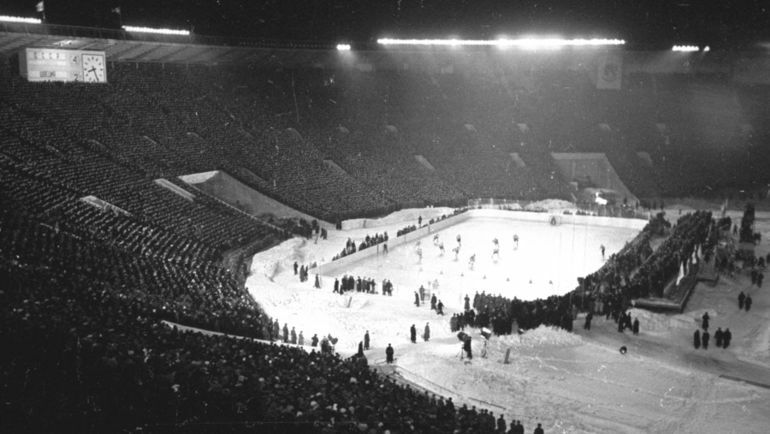 The Luzhniki Stadium hosted the match against USSR and Sweden, and oddly enough the rink wasn’t placed in the center of the pitch, but on a side. Otherwise, fans wouldn’t stand a chance to see the puck from the elevated stands of a 100,000-seat stadium. More than 55,000 were in attendance for a new World Championship record that lasted long. The fans that flooded the gates, however, were mostly disappointed. The USSR needed a win over Sweden to gift the country a gold medal, but the game ended with a 4-4 score, a draw that meant silver medals for the hosts (and gold for the guests). Lake Baikal, March 28, 2014. Lake Baikal was probably the most extreme and exotic place among the outdoor games played in Russia and the KHL. It was just an exhibition, but the match will remain in the heart of those who played – a team composed by World Legends and Sports Press as the opposition. One of the players was the Russian analyst Denis Kazansky, who will cover the SKA – CSKA game at the Gazprom Arena on Saturday.